Supercharge your gaming experience with the NVIDIA GeForce GTX 970 video card. The GeForce GTX 970 GPU is powered by next-generation NVIDIA Maxwell architecture, delivering unmatched performance with incredibly lower power consumption when compared to the previous generation. 1664 CUDA Cores and a 4GB GDDR5 memory in 256-bit width work side by side for game redefining performance. You can play today's hottest titles at max resolutions on today's highest-definition displays, all at ultra settings. Performance is just part of the story. The Maxwell architecture is engineered with the new VXGI (Voxel Global Illumination) technology to solve some of the most complex lighting and graphics challenges in visual computing. Scenes are significantly more lifelike as light interacts more realistically in the game environment. Super Resolution technology lets you enjoy the detail and brilliance of 4K gaming, even on 1080p displays. The G-Sync technology ensures smooth, tear-free images by synchronizing the display frame rate to the GPU (requires displays that support G-Sync). An array of NVIDIA GTX technologies is also built in, like GPU Boost, NVIDIA 3D Vision, NVIDIA Surround, NVIDIA PhysX, and GeForce Experience. These technologies together provide the most immersive and competitive gaming experience possible. 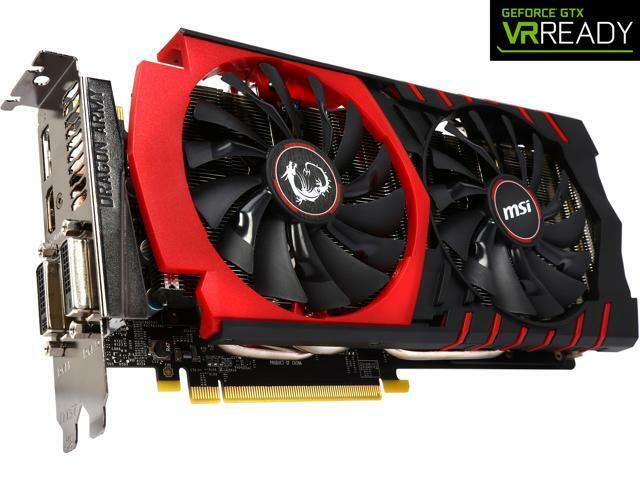 This MSI GTX 970 GAMING 4G LE video card features three performance modes – OC Mode, Gaming Mode, and Silent Mode – to suit your specific needs in different scenarios. This card is built with military-class components, and is factory overclocked, for more graphics performance out of the box. The exclusive Twin Frozr V thermal solution is cooler and quieter than the reference design for better gaming. The latest version of GAMING APP and Afterburner utility make it easy for you to monitor and tinker with your graphics card. The Predator utility lets your record gaming moments for easy reviewing and sharing. Military Class components One of the deciding factors in performance is the quality of the components used. That is why MSI only uses MIL-STD-810G certified components for its gaming cards; only these components have proven to be able to withstand the torturous circumstances of extreme gaming and overclocking. Twin Frozr V MSI’s Twin Frozr series has been the definition of graphics card coolers in the PC industry. Kicking off the dual-fan trend, MSI today stays true to its design, offering the best thermal and acoustic performance in its class. Two powerful 10cm-radius Torx Fans provide a massive airflow thanks to the new dispersion blade, instantly reducing noise by about 5% compared to previous generation's designs. This reduces temperatures by about 10°C at maximum fan speed compared to the Twin Frozr IV Advanced. Under those fans lies a massive heatsink with Airflow Control Technology, which covers 90% of the fans diameter. Connected to the GPU is MSI’s special SuperSU Architecture, which allows the SuperPipes and regular size heat pipes to do their work more effectively. GAMING app The MSI Gaming App offers you one-press activation of each mode, and one-press switching between modes. The OC Mode provides the maximum performance through higher clock speeds and increased fan performance. The Gaming Mode (Default) enables the best balance between in-game performance and thermal. The Silent Mode allows the best environment for minimal fan noise. The latest version of the MSI Gaming App is expanded with MSI Scenamax technology (under the EyeRest tab) to provide you with a number of pre-set display settings. Eye Rest Mode helps you sleep and rest better by reducing the blue light balance of your screen to let your body acclimatize to nighttime. In Gaming Mode, more intense colors and increased contrast let you live the gaming life as the creators meant it. Movie Mode dynamically adjusts the Gamma and Contrast ratios for the clearest movie viewing experience. Multi-Frame sampled Anti-Aliasing (MFAA) With the launch of Maxwell, the Multi-Frame Anti-Aliasing (MFAA) is introduced to the world. This new, Maxwell-exclusive anti-aliasing technique improves edge quality with a minimal performance cost, and helps you enjoy anti-aliased games at ultra high resolutions like 4K. Dynamic Super Resolution (DSR) Dynamic Super Resolution renders a game at a higher, more detailed resolution, and intelligently shrinks the result back down to the resolution of your monitor. This gives you 4K-quality graphics on an HD screen. Voxel Global Illumination (VXGI) Voxel Global Illumination (VXGI) is a stunning advancement, delivering incredibly realistic lighting, shading, and reflections to next-generation games and game engines. improves dissipation efficiency through special heatpipe layout. Fans stop spinning in low load to keep the card quiet and increase lifetime. Deflects airflow towards heatpipes to improve thermal efficiency. Easy Tuning - OC, Gaming and Silent modes adjust Graphics Card settings based on user requirements. Eye Rest: Dedicated color profiles for Gaming, movies and Eye Rest (reduced blue light). Custom color, Gamma, Brightness and Contrast settings from within the Gaming App. Cons: After 18mos. it quit working. MSI has atrocious support. The website doesn't work- the feature to enter a receipt stops the process. Email ignored. Difficult to find a support phone number. When found it took 3 hrs to get a call back. The chat worked and I go an RMA. Turnaround was 3 weeks. Not Fast. the new card was DOA. My wife still can't get back to them. Other Thoughts: The card was fine, MSI was not. I've gotten much better service from other manufacturers. Pros: Runs well, fans are very quiet, performs great. Cons: This card runs very well, but the LE moniker is deemed for lower overclock ability (as in almost none, in my experience). It's supposed to therefore be cheaper than their other MSI 970 Gaming, but here it's much MORE expensive, which makes zero sense. Other Thoughts: This card makes sense for those that would like to save $20 (normally, not here however) on a great 970 and never plan to overclock it. If you have not go through troubleshooting yet, then feel free to contact our tech support team for assistance at 626.271.1004 from M to F, 9am to 6pm Pacific Time. If you have gone through troubleshooting and confirmed the symptom, then please kindly visit the URL below to set up a RMA for warranty service. 6. Please write clear details about symptoms you are having onto the Special Remark section. Once your information and warranty are verified by the system then you will get a RMA# immediately. You will receive a RMA email which indicates the turn-around time as well as ship-to address. If you have any questions or concerns regarding the product or special requests, received the unit back from RMA but are still having issues, please do not hesitate to call us or email us directly and we will be more than happy to assist you, thank you. Pros: Got it on sale for $300, has been fine for me at 1080p gaming on my dell ips monitor, no more messing with multi-gpu setups, overclocks well I leave it at 110 power limit +70 core clock +296 memory clock mostly. My highest setting is +30 core voltage (though I dont think this setting actually applies) 110 power limit, +116 core, +398 memory. I haven't messed with overclocking it in a long time though. Temps are fine and good. Card is pretty power efficient. Not very noisy. I should be getting $30 back for the memory issue. Cons: No cons. Knew it only had 3.5 GB of the good video memory and .5 GB slower memory before buying it. -1070 and newer cards have more video memory. Other Thoughts: About a year and half of ownership and it has done great. The witcher 2, xcom 2 and crysis 3 are the most demanding games I've played and it does fine, Overwatch, CS:GO, Evolve Stage 2, etc it runs those no problems. Far Cry 4 is nice as well but do have to turn some settings down (cant play at ultra with max anti-aliasing and stuff but it looks and plays great once you get the settings around 60+ fps normally. Pros: It's cool. It's quiet. It's fast. It obliterates 1080p. It looks amazing and has cool light settings for the MSI logo. It has a great color scheme. At the time of purchasing, it was the cheapest 970. I got it for around 300 bucks. I was scrolling through the news one day to read that NVidia lost the lawsuit against them over the 3.5+5 gb fiasco. $30 bucks in my steam wallet? Yes please. Pros: - over 60 fps on all the latest games. - Looks awesome! but even with a window in my case, the thing is facing downwards, so you can't see it anyways, but you feel like a bad 'donkey' putting it in, that's the most important part. Cons: - There is a slightly cheaper better performer from AMD that you could get, but that one runs hotter. - There are new graphics cards coming out, so either I wait to get another one and sli with one I bought, or buy a new one when the time is right. the 1070 looks intriguing. Other Thoughts: - I've had very positive experiences with the GTX series cards. MSI makes really awesome stuff, and they look awesome. Other Thoughts: Buying one of these, after already having a 100ME (which is just a Gaming 4G OC), has shown me that all parts are exactly the same. Nothing is wrong with these. In fact, the ASIC on the chip with this one actually is 10 points higher than the 100ME we have. Needless to say, it overclocks great, has the same 8+6 pin power delivery, and easily reaches the same clocks as the non-LE version.